Hey all! It has been a while since I have posted in any of the forums - school, work, and a new girlfriend are proving to keep me plenty busy.. I hope everyone is doing well. The reason for my post today is I have been looking the last few months for a new project. Something to keep me busy for the long winter here in MN. I got to thinking, the last few years I have focused my skills on building motorcycles. Needless to say, I miss having a tractor to wrench on since I finished grandpa"s "41 Case SC. Seems to me the tractor is all complete with a magneto ignition. 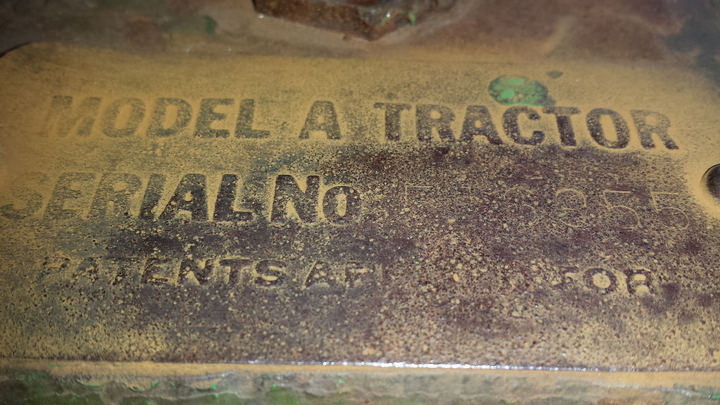 I couldn"t read the tag, as it was pretty corroded. The tires are decent tread, holding air, but weather checked. The shifter, and Hi/Lo range levers both are working. The brakes are not frozen, and the tractor rocks back and forth. Since no one was around, I took a picture of the sign, and figured I could give the guy a call tonight. I talked to the gentleman, and he gave me a little history on the tractor. The last time he had it running was 6-7 years ago. He has a ton of projects going and is starting to get rid of some. It was parked because (as he stated), one of the rods was knocking pretty good. 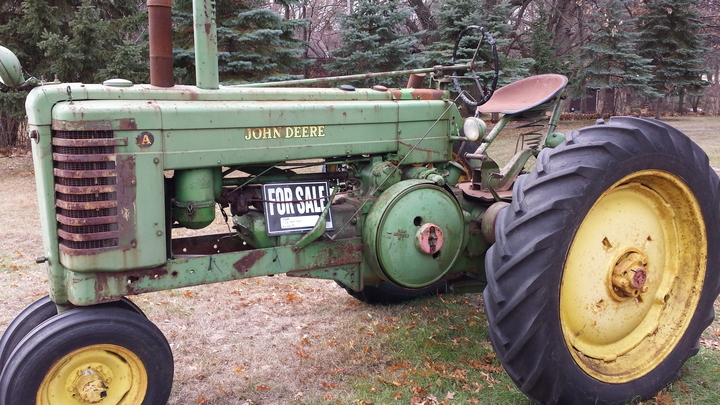 The sign on the tractor stated a priced of $650, but he made no mention of that on the phone and he told me straight out that he wanted $500 for it. The question I have for you is, should I be looking for anything major? Deere"s are quite foreign to me as I have always been an Farmall/Case man. Is this a good price? It seems to me that it is compared to what I have been seeing on Craigslist around here. I may be able to get him down a little bit more on price, I was thinking of offering $400.00, but I don"t want to low-ball him. I talked to a friend of mine that said he saw the tractor there a month or so ago (so it has been for sale for a little while). 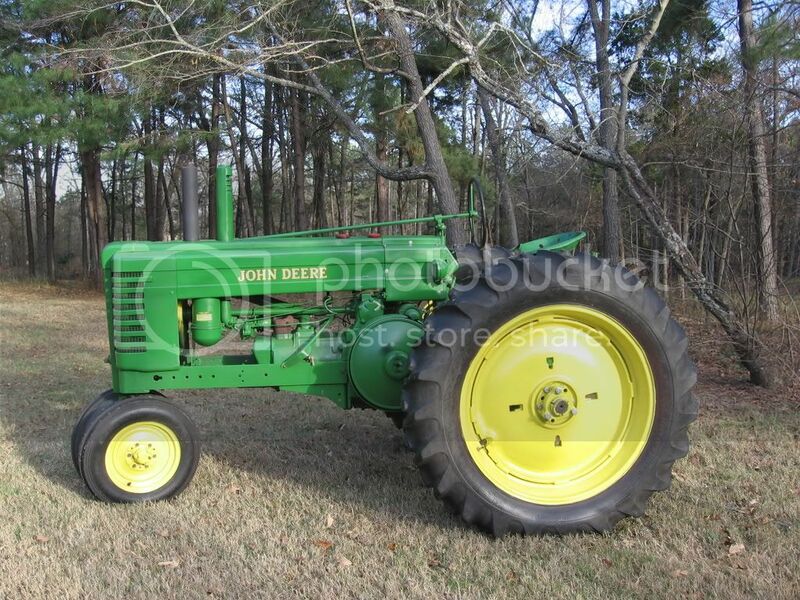 My ultimate goal is to have a tractor that my girlfriend can use for parades at shows, etc. She said that she would enjoy doing that together, which makes me want to pursue it even more. 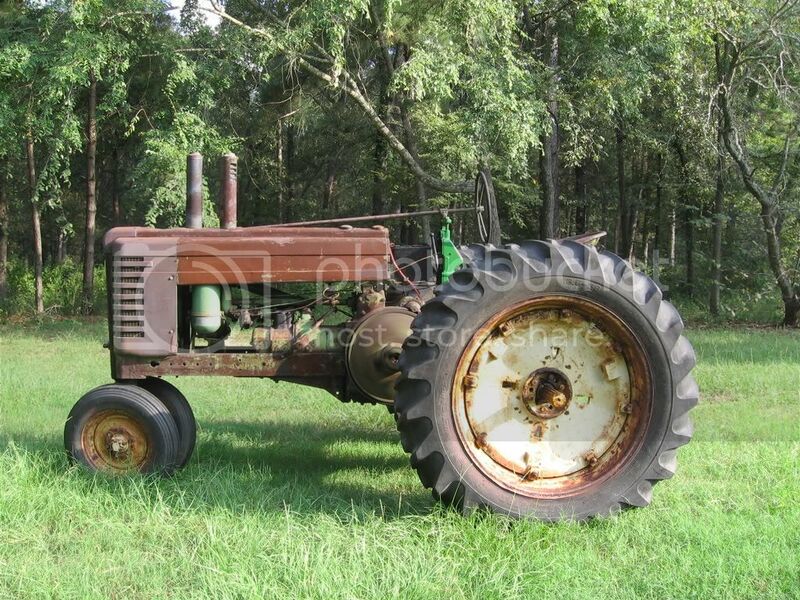 I have enclosed a picture of the tractor to help you all out. See if it is full of antifreeze in the radiator. If so that is a good sign. See if you can see any cracks on the head or block mainly on the bottom. Price is good and there are alot of used parts around for those. I thought the same thing. I have spent a few months looking and everything I can find seems to be in the $900+ range. If I couldn't find a Deere I was going to pick up another Farmall since H's and M's are readily available all day long for $700-$1000 running. I guess I'm not into this hobby to make money. Some are, and that is great. To me, it is a stress relief, a "fix when money allows" type of hobby. I have got way more money into grandpa's Case SC than what I will ever get for it, but I didn't do it to sell it (nor do I ever plan on it). I guess if the project goes sour, and my girlfriend loses interest, then we can always sell it. I think I am going to take the next step and see what he will take as far as offers go. We paid $1300 for "Easy" this running 46A several years ago. 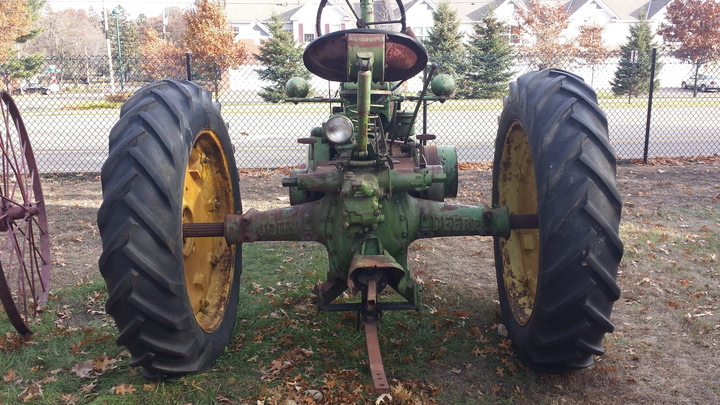 "Easy" has been the one of our easiest tractors to refurbish. Parts are still plentiful and affordable. Cranked it last Sunday to check the antifreeze in the radiator. Good luck with your project if you decide this is the one. If all thats really wrong with it is the knock you'll probably be alright. Your most likely going to have to do a complete engine overhaul to fix the wrap. Grinding the crank is a complete teardown, so you'll be grinding the valves, rings, gaskets, tuneup etc. If, like others have said nothing is broken from freezing and the transmission is decent it would be a go in my opinion. Missing parts is where most of us spend the most money and since this tractor is whole thats a good start. Good Luck! Go get it before someone else does. You will be just fine spending $500 on that, good luck. Well guys, after a second look, and seeing no cracks in the block and talking with the gentleman a little more, I ended up giving him the cash. I ended up giving $450 for it, as it sits. The tin is in good shape, a couple of dents on the right (clutch) side on the hood and lower portion of the grill. The hood has been cut around the muffler, but the patch job was well done. I may consider using the patch to repair the cutting job. He was gracious enough to show me most of his collection as well (which was pretty impressive!). He has tractors from nearly every major make! 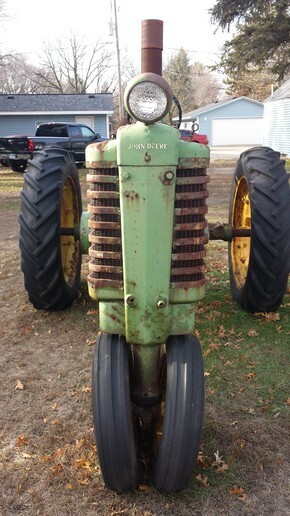 (Several JD's, Massey Harris, a BEAUTIFUL Farmall F-20 wide front on steel, Minneapolis Moline, Case). It was really quite amazing! Enclosed you will find pictures, and the serial number is barely legible (513955) which makes this a 1941. He estimated it to be a 47. It just happens to be the same year as Gramp's Case SC! How neat is that?! Now for the big question: What is the trick to getting the wheel clamps loosened after X amount of years being in the same position. I am going to have to narrow them up when I get over there to pick it up, in order to get it on the car hauler. Any tips (other than lots of lube and a big wrench)? Where in MN are you? Looks like a nice winter project. They are actually rather a fun old tractor. You can idle along quietly in a parade with it. It looks well cared for and well kept. I have a hand start '44 with an 801 hitch on it I use to push snow and a very late long hood. I deliberately disabled the reverse interlock on the hand start which is my snow pusher. In HI R it goes about 7 MPH! Snow slides nicely off the end of the blade that way though one COULD get into trouble real quick! Looks like the serial number is 553355 which is kind of a neat serial number. I believe that makes it a late 1945. I'm sure some others might know better but seems to me that's about the end of the war time steel tags. You asked of getting the clamps off. Usually the bigger trouble is getting the hub to slide after the clamp is loose! Loosen all three but pull only the two beside the threaded holes. Chase the threads in the holes with a tap & clean the bolt threads with a die. Grease his nose & put 'em in the jack holes. Leaving that 3rd bolt in place but loose keeps the clamp from rotating on you with that last turn of the wrench where it breaks loose. Clean the axles & juice 'em up. I use kerosine & ATF to soak into the splines. Even if free and clean they tend to bind because the center of their weight is off center in the hub. The way the cast centers are on this one, they won't slide smoothly unless you push out harder on the top than on the bottom. To move in, push harder on the bottom than on the top. Kind of have to develop a feel for them. Usually if they're loose enough to wiggle, juice, patience, juice, wobbling to crush & break the rust with more juice to rinse it out works 'em loose. I'd have a real hard time passing it up if I saw it though the last thing I need is another tracor! Looks rather well kept. Everything looks to be there and in pretty good shape for a machine approaching age 70. Even the sign holder (the fuel line) looks as it should. I think you did good on that tractor, should be a fun project. But I think I would spend that long cold winter with that new girlfriend. Maybe you can get her to work on it with you. If she does, she is a keeper. No worries on spending time with her. 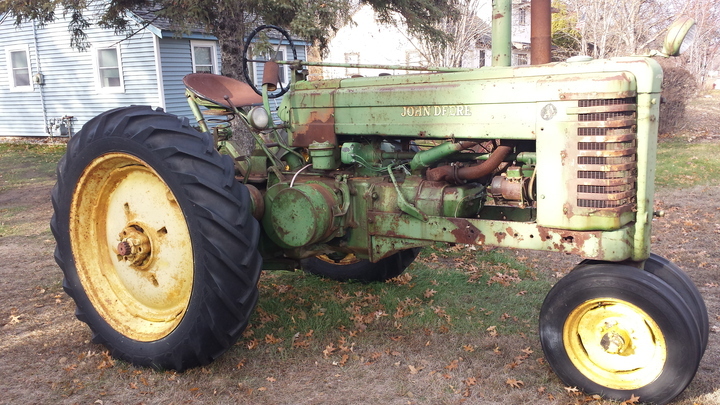 The tractor will be kept at a friends house, so that will make working on it over the winter slow. She will be more excited to dig in once she gets her hands dirty. She has never done anything like this, which I think adds to her excitement level. We are also currently planning a trip to Chicago for next summer, which ought to be a grand time! Well, after using the "zoom" feature on my computer, and looking the tag over quite well, it looks to me like the serial number is 513955. If I am incorrect on this, please someone point it out. I am not sure how else to identify these Deere's like I said. I have always been a IH/Case guy. I just have always loved the sound of the johnny poppers, and had to have one for myself. What better way than to get one that the girlfriend can enjoy at shows? !